Danny Castro, "the ice man," has been standing on the same corner at Chambers and Greenwich streets for nearly 25 years. Every weekday, from April to October, Castro, 63, raises the umbrella above his cart, with its five-flavor offerings of ices. The heat, he says, is the hardest part of the work, "But I don't have a choice, because it’s a seasonal job and that’s when business is good." A longtime customer, Manuel Cabrero, interviewed Castro in Spanish recently and, translated, this is what he told him. Can you tell me about when you first starting selling ices here? It was March and people thought I was selling soup because it was still cold out. I almost gave up and returned back to the Bronx. But slowly some Hispanics who knew the product, like your family and others from Independence Plaza and students from BMCC started buying it. Yes, I have my own license and permit, andI buy my product from Delicioso Coco Helado, which is the first company to make these products. The ices originated in Puerto Rico. A Honduran man went to Puerto Rico and decided he could make a similar product in New York CIty due to the many Hispanics here that like the ices. Now it has expanded to Boston, and other cities. After 30 years is well known. My son Adrian was a good customer of yours when he attended P.S. 234 many years ago, and he always remembered you. Relationships seem to be important to you. Yes, I remember him. He used to like coconut and mango flavors. The relationships I’ve formed are due to the respect I give to the customer and the respect I have gotten from everyone. I have always valued that respect. There was a marketing guy who worked on Wall Street and he suggested I make a sign for my cart calling it Danny’s Ices because of the relationship clients had with me, and that worked out well. I am happy and satisfied with my success. In all my years I’ve never had a difficult time with anyone and never gotten any complaints about my business or my behavior from any individual, organization or business. During the last three years I was even invited inside the P.S. 234 graduation ceremonies with my ice cart. Can you tell us about your background and your family? I am from Nicaragua and my wife came first, in 1986, due to the revolution there. She had family here. Now I have become a U.S. citizen. My wife is retired and she stays home. 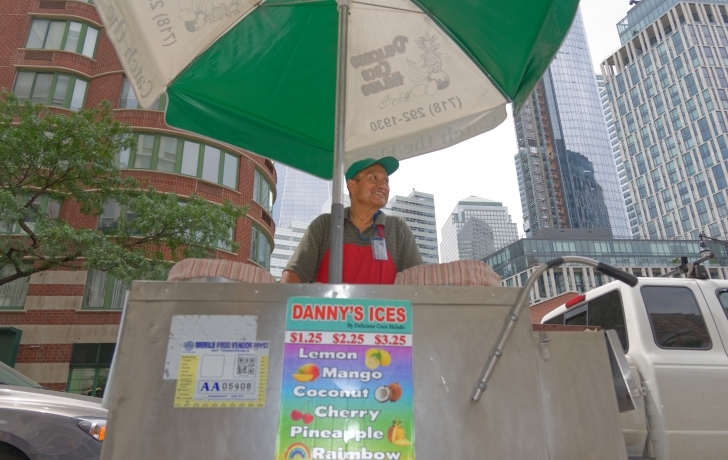 Danny, we see you here during the warmer months, what do you do when you don’t sell ices? How do you feel about this neighborhood and its people? Well, just imagine after being here over 25 years, it’s like I’m part of the neighborhood and the people here have treated me well and as a person, not just a business. They even tell me that I’m part of this community and, at first, I didn’t understand that, but I do now. As you know Stuyvesant High School. is here and many students return as professionals to greet me. I’ve had neurologists, police officers, doctors, lawyers, come up to me and say “Danny, do you remember me?” And I sometimes say “No,” and they say, ”I used to buy ices from you” and it gives me great satisfaction that they would come back to say hello.